House of Cards, a BBC production done is one of the best modern political intrigue/satires in recent television history. It is a 1990 political thriller television drama serial by the BBC in four parts, set after the end of Margaret Thatcher’s tenure as Prime Minister of the United Kingdom. It was televised from 18 November to 9 December 1990, to critical and popular acclaim. The story was adapted by Andrew Davies from a novel written by Michael Dobbs, a former Chief of Staff at Conservative Party headquarters. Dobbs’s novel was also dramatised for radio for BBC World Service in 1996, by Neville Teller, and had two television sequels. The House of Cards trilogy was ranked 84th in the British Film Institute list of the 100 Greatest British Television Programmes.The cast, the story, and the exacting attention to detail make this a piece worth watching and re-watching, to see what details escaped notice the first time. An adaptation of the Michael Dobbs “House of Cards” trilogy. Ian Richardson plays Francis Urquhart, Chief Whip of the Conservative Government, who schemes his way to 10 Downing Street through blackmail, backroom deals, and sheer gall. The second volume, “To Play the King” shows Urquhart up against the newly crowned King (Michael Kitchen) with Britain not big enough for the two of them. “The Final Cut” shows Urquhart hanging on against the wiles of the younger generation, while Diane Fletcher, as Urquhart’s loyal, Lady-Macbeth-like wife, has her greatest acting moments. Francis Urquhart is the chief whip of the Conservative party. When Margaret Thatcher resigns as leader, he remains neutral and after a general election where the conservatives are returned with a reduced majority, he fully expects the new Prime Minister, Henry Collingridge, to give him his just reward: a senior Cabinet post. When he’s informed that he is to stay in his current position, he devises a plot to unseat Collingridge and ensure his own election as party leader which would make his Prime Minister. Francis Urquhart, Chief Whip, manipulates things and people to achieve his ambitions in the Houses of Parliament, all the while keeping his hand carefully hidden behind the scenes. But Mattie Storin, a young reporter, may be getting too close to him. The series opens with Conservative Party Whip, Francis Urquhart, fondly holding a portrait of Margaret Thatcher, remarking that all things, no matter how good, must come to an end. This perfectly sets the time and tone of what is to follow. Urquhart must maneuver and control the political scene in the power vacuum left by the exit of the Iron Lady.Behind the villainous F.U is his complicit wife played with dangerous charm by Diane Fletcher. It takes a special kind of woman to suggest her husband ‘press the flesh’ with a pretty young journalist in order to further their aims. The Plot: As the story opens, Thatcher has just resigned. There is a brief glimpse of an inner-party election for a new leader, and the moderate, middle candidate Henry Collingridge wins the post, and proceeds to barely win the next General Election. Almost immediately following this event, tempers begin to flare as Urqhart is denied the promotion he had sought, and is disgusted with Collingridge’s ‘politics as usual’ stance. Francis Urqhart, Conservative Party whip and functionary, with the unwitting assistance of a junior political reporter Mattie Storin, and the manipulated support of party functionary Roger O’Neill, sets out to undo the Prime Minister, involving the PM in scandals that rock his fragile majority and ever-loosening grip on power. Ultimately, Urqhart’s schemes against Collingridge bring the PM down, and the stage is set for another leadership election. The tone of the House of Cards trilogy is understated in a typically British fashion. Suspense is secondary to the black humour of the character driven drama and unsurprisingly there are no big action set pieces. The twelve episodes are well paced with very little superfluity and capture the essence and intricacy of Michael Hobbes’ three books with excellent detail. The cast is very good, especially in the key roles with Richardson and Fletcher working particularly well together as the scheming and ambitious couple. Colin Jeavons is notable as F.U’s long standing right hand man, with thoughtfully understated turns from many supporting a script which holds interest for the complete 667 minutes. And as the support cast are turned over for each series, the story is refreshed with new characters who are quickly established into the newly formed narrative. Ian Richardson is perfect as the narrator and centre stage Prime Minister of a classically British political drama with a dark comic edge. The evolution of the plot allows the three series to stand alone as they did for television release but belong together as a trilogy. To reveal detail of the third is to deny some intrigue of the first, and though not exceptionally taut in terms of suspense, we are better served in seeing all the threads slowly come together as story by story the house of cards is built. Richardson rightly won BAFTA awards for his portrayal of Urqhart in each of the three installments, House of Cards and its sequels To Play the King and The Final Cut. These sequels were possibly only because of a BBC change to Dobbs’ original manuscript, which had Urqhart rather than Storin falling from the rooftop garden of the House of Commons. 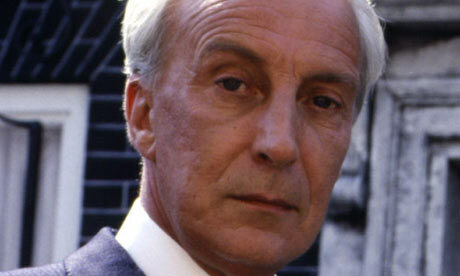 The Cast: Ian Richardson is masterful as Urqhart, the scheming blackheart Chief Whip/Prime Minister. His voice, his subtle inflections and tones are perfect for the subtext in the words he speaks. His sidewise glances and knowing expressions to camera as the action plays out is worth far more than any words. He is a perfect snobbish, upper-class politico who considers political office as patrician right, and despises pretenders to the role. Diane Fletcher is superb as Elizabeth Urqhart, the equally manipulative wife. She is under utilised in this part of the trilogy, coming into her own as a character and an actress in later parts of the trilogy. One gets the strong sense of muted ambition and greed, but not amorality or power for power’s sake from her, a distinction hard to play out on video. Fletcher succeeds beautifully. Susannah Harker plays Mattie Storin, the troubled, intelligent and inexperienced journalist who falls for Urqhart. Her psychological instability and intelligence are played beautifully. Harker can make quite a statement just with the movements of her eyes, making her a good counterpoint to Richardson. Miles Anderson plays the drug addict/party operative Roger O’Neill, doing a good job at playing the cad, the coward, and the fearful go-along with Urqhart’s schemes. A rat trapped, O’Neill is at the breaking point, and Anderson plays this admirably. Perhaps the best secondary roles were performed by Alphonsia Emmanuel, who plays O’Neill’s assistant and lover Penny Guy, and James Villiers, who plays Charles Collingridge, the deposed Prime Minister’s troubled brother. Their roles shine brilliantly despite the relative lack of screen time. Netflix Commissions American Remake Of House of Cards: The iconic British TV show is set for an American makeover: this time the plan is to revive and transplant House of Cards. The blackly comic political thriller was written by Michael Dobbs and its 1990 BBC adaptation won awards for Andrew Davies as writer and Ian Richardson for his role as the unscrupulous Francis Urquhart. The team behind The Curious Case of Benjamin Button, director David Fincher and writer Eric Roth, would be working on the remake.The US version, produced by Fincher and Media Rights Capital, will move the action from the UK to America. 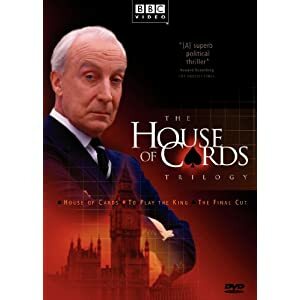 Actor Ian Richardson Dies (guardian.co.uk, Friday 9 February 2007) – The actor Ian Richardson, best remembered as the Machiavellian chief whip Francis Urquhart in the landmark BBC drama House Of Cards, died today. He was 72. Richardson died in his sleep at his London home in the early hours of the morning. His death came as a shock as he had not been ill and was due to begin filming for the television show Midsomer Murders next week, his agent said.